Home > Body, Mind & Soul > What is Meditation? Meditation is a means of relaxation, medical treatment and spiritual progression. The word itself finds its roots in the Latin 'meditatio' which means intense reflection or contemplation of an intellectual kind. In English, the word is still often used to denote deep logical thought, yet is more widely now used to indicate a process of clearing the mind by concentrating. This can take place through the conscious adoption of specific postures and breathing techniques, or the mindful awareness of the moment. In either case, the aim is to momentarily evade an awareness of both your bodily restrictions and functions and your temporal boundaries. As you forget your physical restrictions, and the passing of time, all causes of stress are temporarily suspended. This can both refresh the mind and lead to a more well rounded and focused outlook as worry about both the future and past is surpassed and life is lived for the moment with no sense of urgency. Meditation is practiced in different ways across spiritual disciplines (see related article: The History of Yoga). The ultimate aim is to reach a realisation of the true state of things, or the true nature of God, by shutting off thoughts about transient everyday occurrences, which cloud our perceptions. Some spiritual practices require that meditation be practiced sitting in prescribed formal postures with set breathing patterns, such as the 'lotus' position practiced by some Hindu's as Buddhists, whilst some spiritual forms teach that meditation can be practiced in the position and breathing pattern most appropriate for the individual. Yet other forms (such as those advocated by late Indian guru 'Osho') take radical approaches to meditation: Osho advocated, alongside more traditional approaches, deliberate 'laughing' and 'crying' in order to reach a meditative state. Members of Subud, (an international spiritual group) meditate by openly submitting to God, with no preconceptions to what this might entail. This practice of 'latihan' (meaning spiritual training) manifests itself in different ways for different people depending on their situation and their life's task. 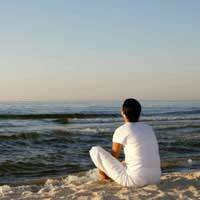 Meditation is practiced by many people purely to reap the health benefits of which there are many (see related article: Benefits of Meditation) and for relaxation. This can involve a variety of forms of meditation, many not dissimilar to the practice of focusing on one's breathing as a spiritual pursuit. The main difference here is that the individual practicing meditation will perceive their sense of wellbeing arising not from their becoming closer to God or enlightenment, but as a result of healthy breathing having a positive effect on their cardio vascular system, as air is essential to the effective flow of blood around the body. Others cite the psychological benefits of meditation, as clearing thoughts helps to rest the conscious mind and harmonise it with the subconscious - much as dreaming does. Other forms of secular meditation include 'attentiveness' or 'mindfulness', which involves being aware of the instant moment for periods throughout the day. You could, for example, decide to close off your thoughts and become intensely aware of the sensations immediate to you on your walk to work. By doing this you will gain much the same as you would by undertaking breathing exercises - although it is good to watch your breathing as well. Despite the many forms of meditation the aim overall is to calm the mind and body through a careful observation of the instant moment. The growing popularity of meditation in the west attests to its relaxing properties in the face of increasingly hectic world.